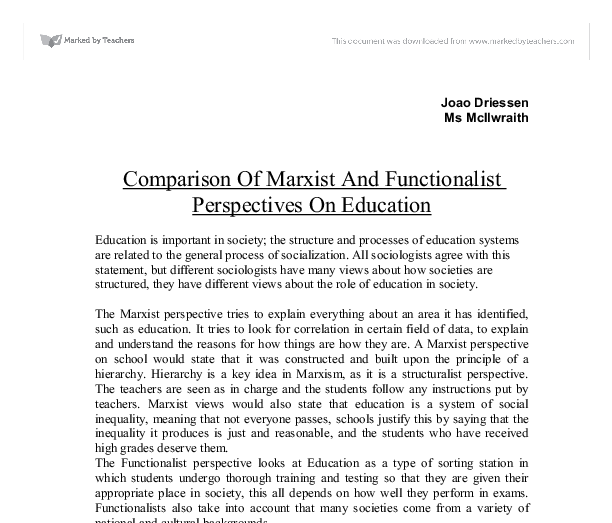 Comparison Of Marxist And Functionalist Perspectives On Education Education is important in society; the structure and processes of education systems are related to the general process of socialization. All sociologists agree with this statement, but different sociologists have many views about how societies are structured, they have different views about the role of education in society. The Marxist perspective tries to explain everything about an area it has identified, such as education. It tries to look for correlation in certain field of data, to explain and understand the reasons for how things are how they are. A Marxist perspective on school would state that it was constructed and built upon the principle of a hierarchy. Hierarchy is a key idea in Marxism, as it is a structuralist perspective. The teachers are seen as in charge and the students follow any instructions put by teachers. Marxist views would also state that education is a system of social inequality, meaning that not everyone passes, schools justify this by saying that the inequality it produces is just and reasonable, and the students who have received high grades deserve them. The Functionalist perspective looks at Education as a type of sorting station in which students undergo thorough training and testing so that they are given their appropriate place in society, this all depends on how well they perform in exams. ...read more. Schools fulfill the task of preparation, and cater mostly for the working class. They emphasize rule following, obedience, and passivity, which is the same sort of discipline found in shops and factories. Schools which cater for children from wealthy backgrounds, middle class + upper middle class, emphasize the need for leadership, as they will form the future elite. This explains the inequality in capitalist societies; inequality in the education system is reflected into capitalist society, which in turn, bounces back in the education system, creating an unbreakable chain. 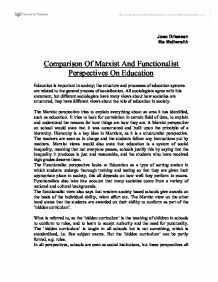 Marxists perspectives also emphasize the reproduction of Labor Power through education. Althusser was a French Marxist philosopher; he looked at how the economy plays a role in structuring society. Education is shaped by societies economic base. And therefore serve the interests of the ruling class. Althusser argues that the reproduction of labor power involves two processes, the reproduction of the skills necessary for an efficient labor force, and the reproduction of ruling class ideology and the socialization of workers into it. The function of Education in a Functionalist world would be selection. The education system selects people and allocates to them certain jobs according to their capabilities. ...read more. The functions of the education system I have mentioned, as part of a Marxist and Functionalist view are in no way 100% neither proven nor discredited. Both perspectives also see the education system as not always fulfilling these functions. In the Functionalist case, this would be called, dysfunction. And in the case of Marxism would be called, Conflicts, or Contradictions. The education system may not be as perfect as the Functionalist theory makes it out to be. Take for example the selection function. It is that of choosing functions for particular individuals based upon ability, but often is the case that these choices may be made in favor of family background. This is something the Marxist perspective on education has always quoted on, Class. Functionalists prefer to look at education as a perfect system, which builds a unity, or conformity. But they do quote on the inequality of some education systems, as dysfunction. The Marxist theory leads us back to the reproduction of society and education being a piece of a complete cycle; education copies society and societies absorb people from education. But this reproduction also means that inequalities, conflicts, and contradictions are also reproduced. The education system and it's problems are just versions of more general class conflict within society. ?? ?? ?? ?? Joao Driessen Ms McIlwraith ...read more. This student written piece of work is one of many that can be found in our AS and A Level Work & Leisure section. This allocation means that qualification are rewarded to the most academically talented students, which in turn leads them to the most functionally important jobs with the highest rewards. This shows that the education system facilitates a meritocracy, where effort and ability are rewarded, thus leading to an achieved status rather than an ascribed status. learn that status is to be achieved not ascribed as in the family. Parsons argues that the school acts as a bridge between the family and wider society, that is between childhood and adulthood, where children stop being judged by the particularistic norms of their families and are judged instead universalistic norms of society. 'Education is a tool of the ruling class'- Discuss. By law, in most western countries, school is compulsory for at least 11 years of your life and is a very significant part of people's lives, if because of nothing else the enormous amount of time spent there. It is because of this significance that it comes to hold a lot of power. Learning to labour was a key study carried out by Marxists, including Bowles and Ginits, and Willis to provide evidence for the correspondence theory. They viewed the role of education as the belief that capitalism is unjust and oppressive and that it explains the workforce because schools reward hard work, conformity and obedience. Assess Functionalist and Marxist approaches to the relationship between education and economy. Parson are stated that within the family the child is judged on particularistic values and in a society the child is judged on universalistic standards, which are standards applied to every individual in society. The child moves from particularistic standards to universalistic standards. Although this system has been highly criticised since it was first introduced there are a number of factors which imply and suggest that although the comprehensive system is less divisive than the tripartite, it still does little to engender social equality if anything, serves to reinforce class inequality. Looking for expert help with your Sociology work?